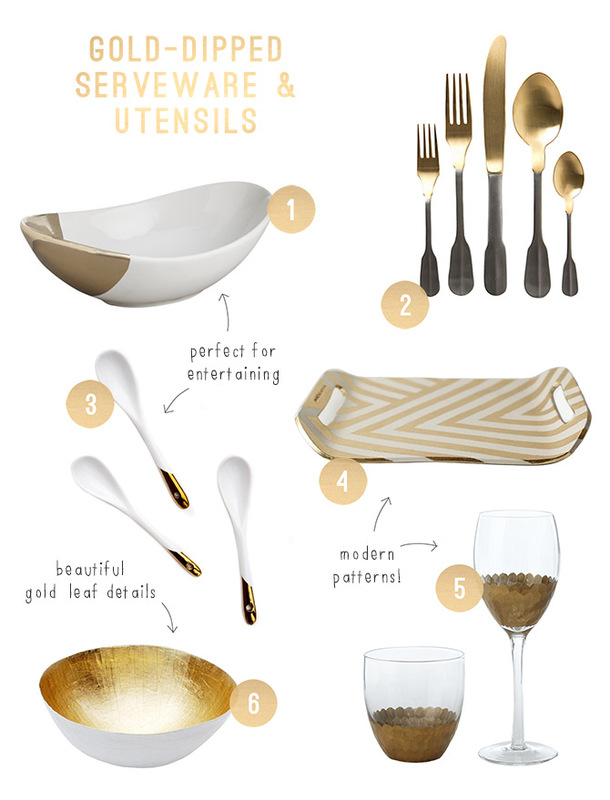 Best Of: Gold Dipped Serveware & Utensils | Evermore Paper Co. When it comes to my kitchen dinnerware and serveware I’ve always been drawn to white pieces. They serve my OCD habits well, especially since everything always matches and can easily be replaced if broken (which happens more than I’d like to admit). However, after recently spotting Nate Berkus’s dipped bowl, I realized that it might be time to spruce up my collection. Rather than replace what I already own, I thought these gold-dipped items would be the perfect enhancements to my current set and ideal for entertaining. And while the tray may not exactly be dipped in gold, it was just too beautiful to exclude from the list.